I am no big fan of graphic novels. I find them less satisfying than books because of the peculiar way I read. It appears I process language directly off the printed page without subvocalization. IF the book is the right sort of book, and if I am in the right sort of mood, I merely open the book and watch the movie projected for me by my imagination on the frontal lobe of my brain. It is hard for a graphic novel to compete with that. Unfortunately, that makes the better part of Neil Gaiman’s body of work inaccessible to me. Most people ask me, when they learn of my interest in Gaiman, how I liked the Sandman series, and I have to confess that I know very little about it. This is a major lacuna in my knowledge of fantastic literature and mythopoesis. 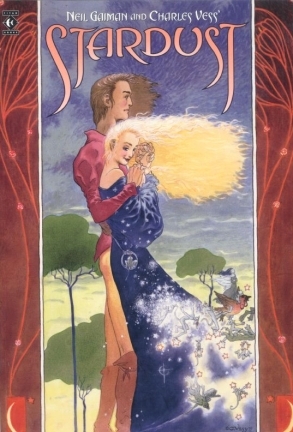 With the possible exception of the Joss Whedon’s Buffyverse, Sandman is probably the best known and most beloved post-Tolkien legendarium out there. Nevertheless, Mr. Gaiman has published some traditional novels. I read and enjoyed American Gods earlier this year. Neverwhere I was unable to finish because the male protagonist was so unappealing (honestly, he reminded me too much of myself). But Stardust, which appears to be his first novel, has completely enraptured me. I am not enough of an authority on Gaiman to comment on what others have found in the book; that it is different from the rest of his works. It does lack the brooding melancholy that I found so deeply embedded in Coraline, Neverwhere, or American Gods, and so, it is a much brighter work than any of those others. Another thing I appreciated is the almost encyclopedic knowledge Gaiman commands over fantastic and folkloric themes. You know a falling star has to be a beautiful woman (Gabrielle Anwar as Ramandu’s daughter in the BBC version of Voyage of the Dawn Treader), you know that a ruthless king must have seven ambitious sons, of whom the youngest is the canniest and most relentless in his ambition, and you know that a boy inevitably must pass through fire and water to become a man. The book was made into a movie, which I also enjoyed thoroughly. It was better than any other fantasy film I have ever seen, apart from Jackson’s Tolkien films. I preferred it to Willow, to Labyrinth, to Terry Gillam’s Baron Munchcausen, to either of the Narnia films, and even to The City of Lost Children, which is high praise indeed. Of course, I love Claire Danes, Michelle Pfeiffer, and Robert DeNiro, who I never would have believed as a cross-dressing pirate if I hadn’t seen it. As an aside, there are fantasy movies which are unwatchable. Please avoid Eragon, The Golden Compass, and Inkheart. Take my word for it.